Please note, in some of the pictures and video in this site appears a more advance model of this meter. Highly recommended as a ELF EMF/EMR meter (magnetic fields from electric power line, electric devices, power converters)! The TRI-FIELD 100XE ELF EMF/EMR Meter is an excellent and very accurate 3 axis low frequency electromagnetic radiation meter. It can also measure electric field and high frequency (RF) electromagnetic radiation, but I found it to be less usable. The TRI-FIELD 100XE ELF EMF/EMR Meter can measure high frequencies of electromagnetic radiation but only from the high level of 10 uW/cm2. 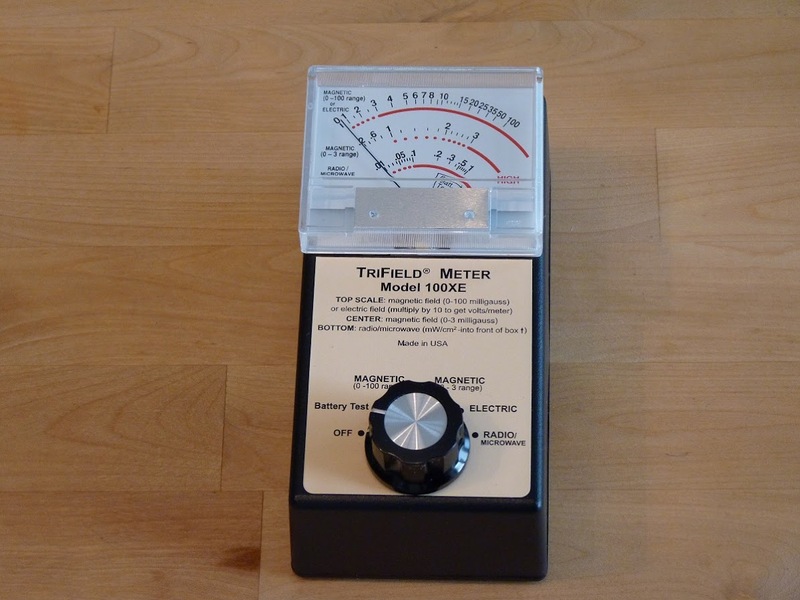 The TRI-FIELD 100XE ELF EMF/EMR Meter is most usable for low frequency measurements. The TRI-FIELD 100XE ELF EMF/EMR Meter has an analog display with 3 scales, and a big selector switch on the front, that can select between the different operation mode of the TRI-FIELD 100XE ELF EMF/EMR Meter (OFF, Battery test, low frequency magnetic 0-100 mG, low frequency magnetic 0-3 mG, electric and radio/microwave modes. The TRI-FIELD 100XE ELF EMF/EMR Meter uses a 9 V battery, and needs to be opened (unscrewing 4 bolts on the back cover) in order to change it. I have it now for 2 years and I have never changed the buttery (very important to switch it off at the end of use). 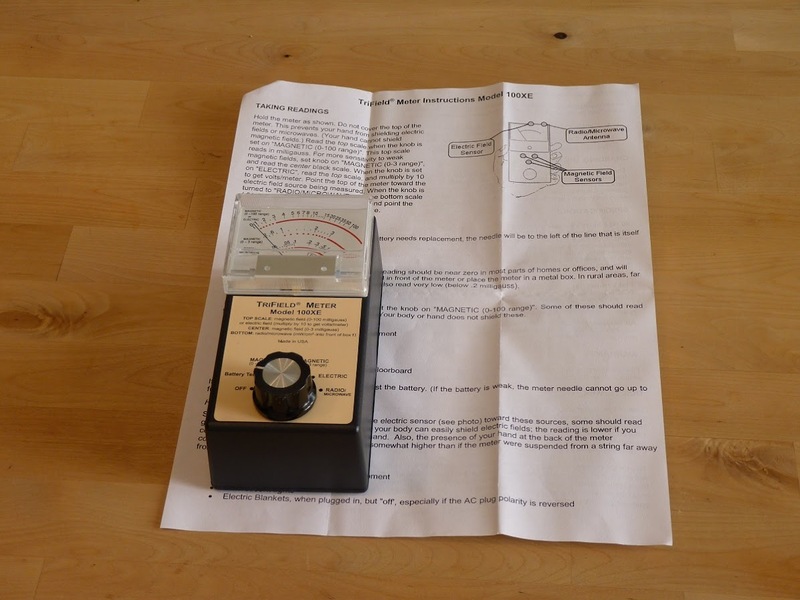 I use the TRI-FIELD 100XE ELF EMF/EMR Meter a lot for measuring low frequency electromagnetic radiation levels, for finding EMF sources, both in house and outside the house. Voice indication in some of the modals - Special order, extra charge. Can be ordered with calibration certificate - Special order, extra charge. Changing the battery may prove to be not so easy. Not sensitive in high frequency. 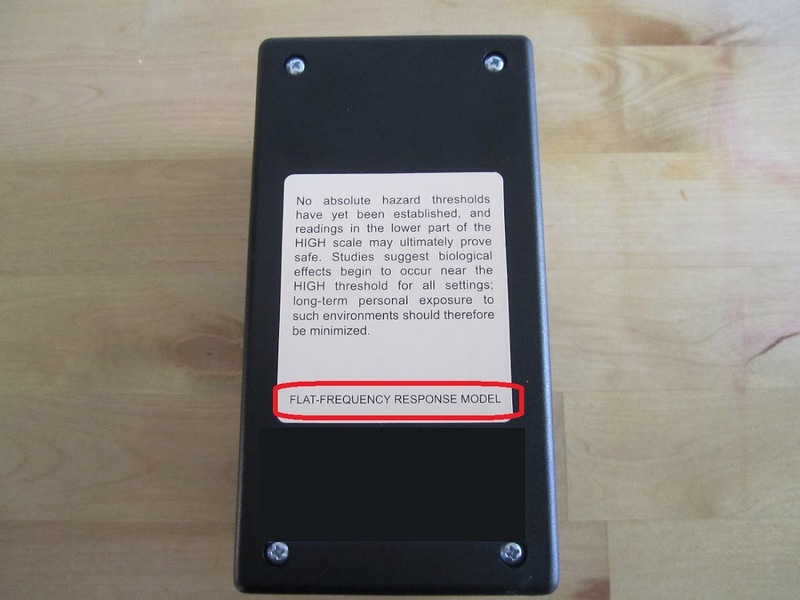 One of the best low frequency EMF meters.